Hi Everyone! I hope you all had a great Holiday weekend. I wanted to do a card using the "Rock and Roll" technique but just couldn't get it...I finally used my markers to achieve this look. 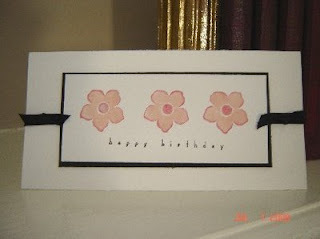 I markered the flower with Blush Blossom and outlined it with a Regal Rose Marker....huffed and stamped. Simple but kind of sweet looking. I enjoy clean fresh lines in cards and it seems like I always have to add a touch of black....just seems to bring it all together for me. I hope you like it. This is very sweet - I love the colors!